Who? What? When? Where? Why? 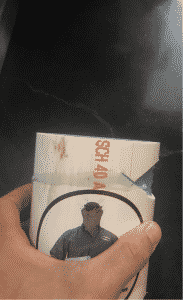 How much…. Well if you’re reading this, then probably you? If you’re smelling sewer gas have a leak showing up on the side of your house and meteris not spinning? You may be having problems with bugs or cockroaches– or having foundation problems? Notice that heaving in the floor? Maybe you’re selling a house or buying house and this word has popped up– Hydrostatic test. There is no extra force other than what would be equivalent to a drain line backing up. In new construction or repair work when testing for the city in most cases we are required to perform these tests on new and repair installations. 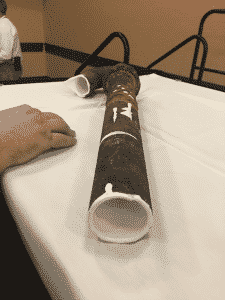 Most of the time we are required to put five or 10 foot of additional head pressure on the pipe. On an existing home for foundation hydro static test we like to try to test to top of the foundation or to a shower pan if that’s possible. Every situation is different, really need to look at the condition of the job to determine what the customer is needing and wanting. We approach the situation to suit the needs of the client. When? Do you need a test? We mentioned before a lot of times this test is required by a foundation company to hold the warranty. 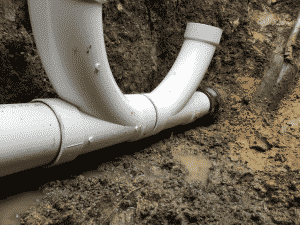 If there are leaks on the sewer line depending on your soil it can wash the soil/sand out or cause heaving (clay) which will potentially cause foundation problems. Water does crazy things over time, you have seen the grand canyon… No matter the soil type the foundation companies usually want to ensure you take the water variable out of the equation before they go jacking up your home. It makes sense. Buying or selling. If you are buying you will want to know what you are up against and minimize risk. Repairs can get expensive. Reason The repairs are expensive isn’t necessarily because the plumber and foundation companies are getting rich, it is a ton of work to go digging under a home to replace We have seen angry husbands and crying wives because they had to fix under foundation problems instead of remodeling the kitchen in their new (40 year old home). Also, if you’re suspecting sewer smells for seen extra activity from the insects including cockroaches, ants, flies could indicate there is a sewer leak under the foundation. If you’re having a chronic drain backup continuously it could mean the water is leaving the pipe through a crack, when the water leaves the solids, paper, and waste tends to stays in the pipe and not coast to the city sewer on the wave of water as it is intended to. Sometimes people have frequent drain problems that’s can be diagnosed by hydrostatic test. Unless it is a big break most of the times you cannot find these problems with a drain camera– (aka- cctv, scope, sever camera) Under a foundation there maybe a lot of branches off of a drain line that cannot be tested with the camera and especially an old pipe there maybe connections to vents that are inaccessible to the camera because of years of essentially tuberculosis of the pipe which almost looks like barnacles on a ship. Even smoke testing can’t find some leaks that a hydrostatic test will find. Where? would one need this hydro static test? Well any building could benefit from this test whether it’s a house, restaurant or even a tilt wall concrete warehouse. Built before 1975… The slow damage that can be caused by a drain or sewer leak can happen anywhere. Just because it may slowly doesn’t mean the leak is not causing damage. If you have a building that required dirt brought in and not native undisturbed soil the damage potential may be worse. The other reason you would test is if you see signs of a foundation problem or want to keep your warranty on previous foundation work. Really finally it’s too keep up with and maintain your investment whether it’s your home or commercial building just because it’s out of sight doesn’t mean it should be out of mind. It will cost more to not fix if you are going to hold on to your investment. If you have cast iron pipes and a building over 40 years old you want to verify the pipes are not losing soil under the foundation or giving the termites and roaches a place to party with a nice moist environment. Of course, how much depends– I bet you knew I would say that. It depends because it really depends on if you have a one bath house built in 2010 with a good double cleanout and the pipe is only a foot deep in the yard as opposed to a house built in 1908 in the hospital district with a basement and no double cleanout that may be 9 foot in the ground. But for starters you can assume a simple test price range will start at $300.00 and go up. If leaks are found on initial hydro static test and you need the leaks isolated with a isolation test it will be an extra cost for the more in-depth test and that test will be based on the number of exits of the building sewer, on the building’s drain / sewer design and again accessibility to the pipe. Many times a plumber will need to pull the toilets to fill to flange level and to remotely place test balls throughout the home. We can evaluate the situation and definitely give you a price to approve before we do any work on testing. We can give you better options on giving you a solution than anybody in the metroplex. 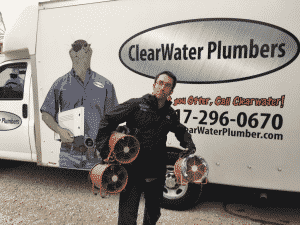 ClearWater Plumbers has made a huge investment in non tradtional sewer repair and replacement. We were introducing city inspectors to “pipe bursting” sewer and drain lines as a trenchless method of replacing sewers and drains back in 2006. 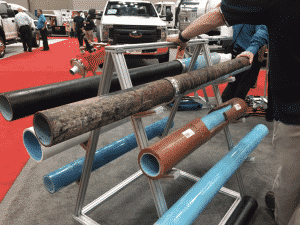 Sure we can tunnel, jackhammer, we can do a trenchless pipe burst, we cure pipe in place, CIPP, Epoxy lining, epoxy coating, polyurea coating, and even hybrid systems combining 4-5 different methods that most plumbers don’t even know exist…. No joke, there is a lot of technology and expertise in drains now a days and I don’t know anyone that does all the methods that we have available to us and ClearWater Plumbers. When rerouting plumbing, drains and sewers we’ve got ways to get under driveways, sidewalks, and trees that don’t require removing concrete or killing trees. Really the first thing that we need to do is find out where your pipe is leaking under the foundation. Then, we can devise a plan that fits your needs and budget. It really boils down to what the customer wants. Some folks may be remodeling a home and don’t mind jackhammering a hole in the floor in the living room or they might already have foundation problems where we can make five large holes in the floor of the home. Some customers don’t like the idea of tunneling under their foundation and want to preserve the dirt under the slab. They may opt for rerouting or especially coating and lining of pipes that way we can make it hold the test for the foundation warranty without removing all of that dirt and putting it back. A lot of times saving digging will save money. If we can save money and offer a better solution that preserves the integrity of your casa that is what makes us happy. I think you’ll find we have some of the friendliest people. We are at your service and aim to please.